The time has come once again to answer life's most magical question: Who's smithing reigns supreme. This is Iron Smith! A delectable Japanese tradition has taken root on MTGcardsmith community forums soil. We have been graced with the establishment of our very own Smithing Stadium, where our nimble chairman has brought together the most pungent card designs of both east and west. It is here, where the best of the best from around the world meet and face the ultimate card design challenge. 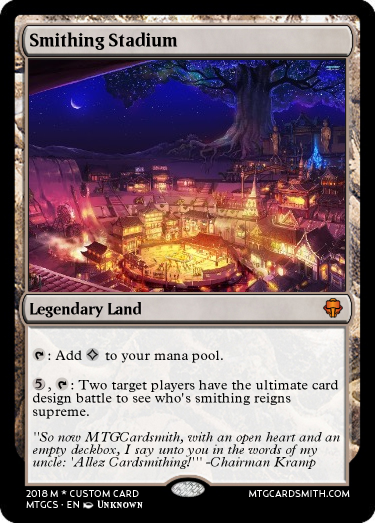 So please allow me to introduce a veritable pantheon of cardsmithing giants, your very own Iron smiths MTGCardsmith community forums! In mere moments, one Iron Smith will be pitted against our challenger, who thirsts to discover our secret ingredient, and enter the heat of battle here in smithing stadium. Wait whats that. No one has qualified for the competition yet? Well bother. I guess we will have to change that! Iron Smith is a competition that puts a "challenger" (that's one of you!) against one of 5 Iron Smiths in a 1v1 cardmaking battle to the death. In each battle, smiths will be designing a specified amount of cards (Between 3-5) based on a certain theme. Each competition will be one week long. Iron Smiths and Challengers won't know who they are facing beforehand. Can I be an Iron Smith? 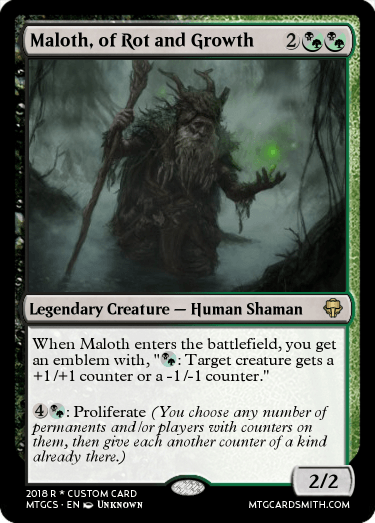 The MTGCS community members who will be Iron Smiths have already been hand-selected. You will be competing for a chance to battle against one of them. So then who are these Iron Smiths? Thats a secret! Don't worry, you will all find out in due time! How do I qualify to be a challenger? When is my submission due? Thursday, February 1st at 11:59 CST. What happens if I qualify? You will get three things for qualifying. #1: A chance to battle one of our Iron Smiths in a 1v1 Cardsmithing duel. #2: A -TROPHY- and a spot in the -HALL OF FAME- at the conclusion of your battle. #3: 2 favorites on cards of your choice. After you qualify, you will be sent a message to chose your week for the battle. After all of that, what happens if I defeat an Iron Smith? Other than the aforementioned-TROPHY- and spot in the -HALL OF FAME-, you will be given a one-month premium subscription, courtesy of @Modnation675! WOAH! So much fame, honor and glory to be won! I'm definitely gonna try making a good one for this! So they’re famous cardsmiths? I’m guessing Faiths_Guide and Corwinnn are up there. Looks like it will be a great contest. We'll just have to see the starting entries. @Swegboss12 That's great! I can't wait to see what you make. @modnation675 I cannot wait to see what everyone makes out of this. So I've been trying out Magic Set Editor lately and it's quite good. But I'll admit these forums are much more fun to use than MSE's. So I'm very glad a large contest has been started. Hopefully we'll see more. @Fantastic_Fantasy_Cards Cool design! 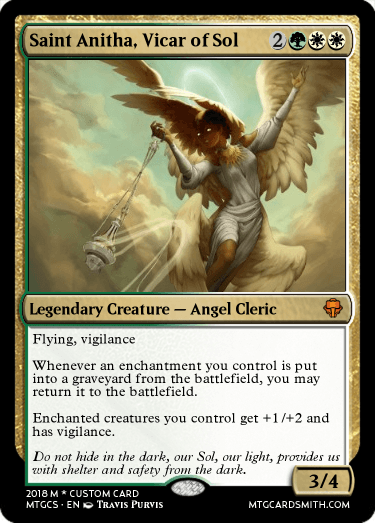 I would look at the wording on the card though... it doesn't quite use official MTG wording. @modnation675 Yeah, MSE is pretty cool. I think it has a few advantages over MTGCS, but it's community is not one of them. 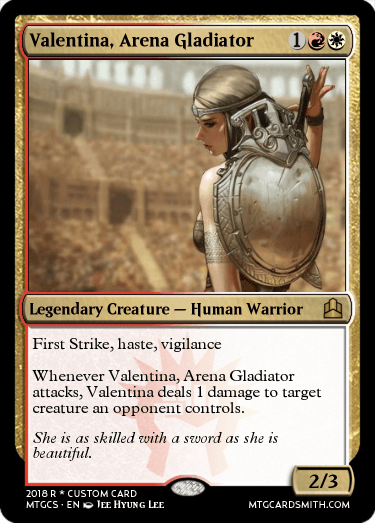 Also how do i make the card become a portrait like what @Fantastic_Fantasy_Cards did. It has been a while so I forgot. Thanks. @AlphaOmega follow this useful guide created by @modnation675. @KrampisZman Thanks. I'd already used my better idea (instants/sorceries become creatures upon resolving) in an earlier card, so I had to think of something else weird. And the first 2 days of this challenge have passed. We have seen some really cool entries so far, but who else will take a step into Smithing Stadium? My preliminary entry which i may change if I get inspiration for a better card. my hat is in the ring. Can anyone enter this? If so I'll throw a big dumb angel in the mix. @zizick123 @IanLowenthal Nice cards guys!